Ahh, acai! That refreshing purple berry deliciousness. (ah – sigh- EE), grown in South America, are an excellent source of antioxidants, fiber, minerals like potassium, manganese, copper, iron and magnesium, and heart-healthy fats like omega 9 and omega 6, which help reduce LDL cholesterol levels, while raising good HDL cholesterol. Due to the craze that acai has experienced, it has made a great impact on the Amazon. To learn more check out this study, and click here to learn more about Sambazon and how they are working with local communities to harvest sustainable acai. 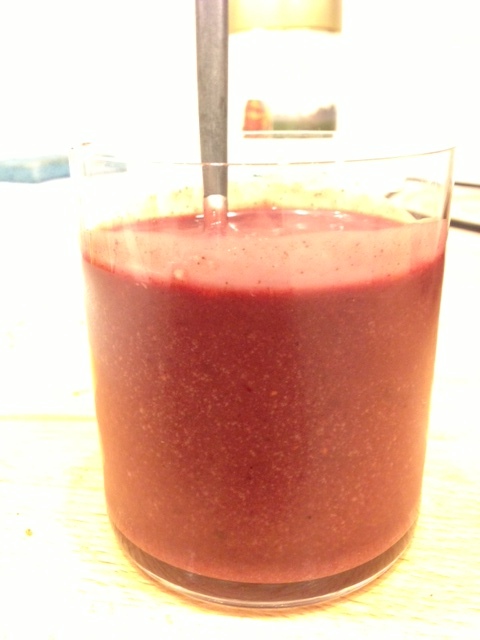 Here is a delicious way to use acai in your everyday, it can’t get easier than this! Blend together. Enjoy on it’s own, or add in some granola and shredded coconut for a crunchy twist. Trick to tastiness: eat a few minutes after you’ve blended it all up, for a creamier texture. While those store bought granolas can be quite tasty, they may contain higher amounts of sugar than necessary. 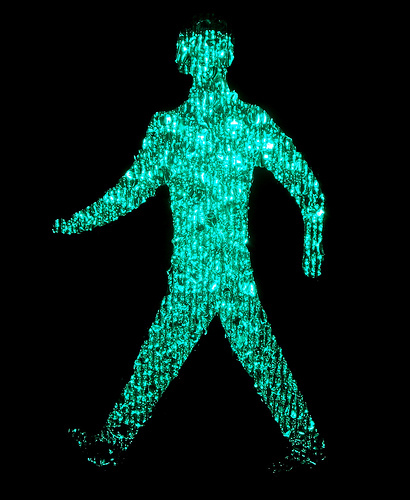 All the more reason to make your own! Not only will you save money, but you can also tailor it to your liking, while controlling the amounts of sweetness you add in. Here’s a simple granola recipe that is nut-free, and can be gluten free if you use gluten free oats! 1. Combine dry ingredients: Preheat your oven to 375F. Add in oats and seeds into a big bowl. 2. Add in wet ingredients: Pour in maple syrup, honey, canola oil and vanilla. Mix well. 3. Prep and cook: In a large baking sheet, add mixed granola and spread evenly. Place in oven and let cook for 10 minutes. Stir the granola around in the sheet pan to get it cooking on all sides, then cook for another 10 minutes until light brown. Remove from the oven, let cool. 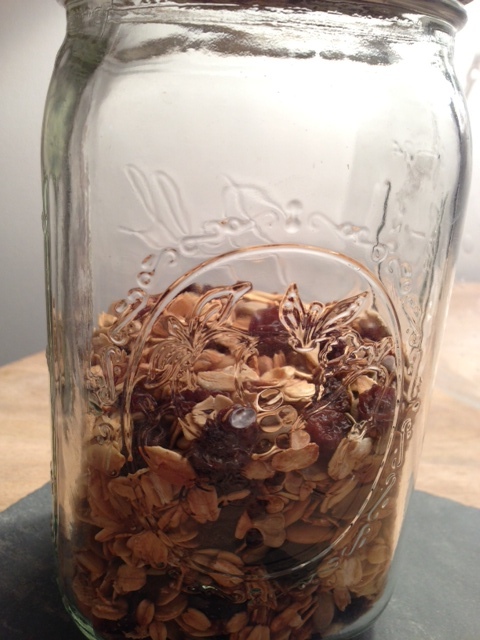 Add in your raisins, then store in a glass container. Pairs well with yogurt, smoothies, breakfast sweet potatoes, or all by itself for a delicious and nutritious snack that surpasses the coolness (and cost) of the store bought kinds. When you think brioche rolls, your mind most probably goes straight to a vision of burgers cooking on the grill. Let’s rewind and change that thought in honor of Earth Day. 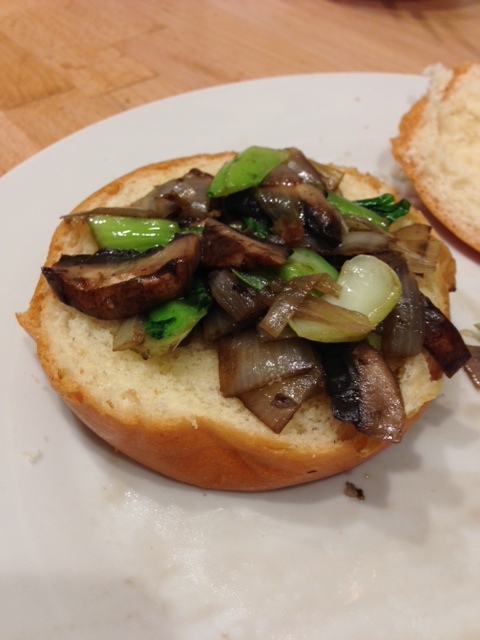 Brioche rolls with portobellos, bok choy and caramelized onions, that’s sounds much more refreshing, and Earth friendly! 1. Prep: Rinse your mushroom then slice it, dice your yellow onion, rinse and chop your bok choy (separate the stems from the leaves, as the stems need longer to cook). Cut your brioche in half, toast if you wish. 2. Cook: In a medium sized pan, heat up olive oil then add onions, stirring for 2-3 minutes. Follow with bok choy stems, stir for 2 minutes. Add in portobellos, sprinkle in a bit of salt then stir for 3 minutes. Finish by adding bok choy leaves, stir everything together for another 3-4 minutes, until portobellos are soft. 3. Assemble: Set out your brioche roll, cut in half. If you like it open faced, keep it open, if not add veggies to the bottom roll, then place top roll on top, cut in half then dig in! What to do with fish? It’s not as intimidating as it seems, we promise! Here’s how to cook up a simple piece of fresh flounder into a delectable dinner experience. It’s all about perception, so why not make your plate look pretty while you’re at it! 1. Prep your sauce: Chop up your garlic, add sesame oil, tamari, vinegar and lemon juice into a bowl. Whisk it up! 2. Cook: Heat up a medium pan over medium heat, add your sauce. Once sauce is heated, add fish right on top. Let poach in your sauce for 5-7 minutes on each side, depending on the thickness of your fish. It’s ready once it starts flaking and is no longer grey inside, rather white. 3. 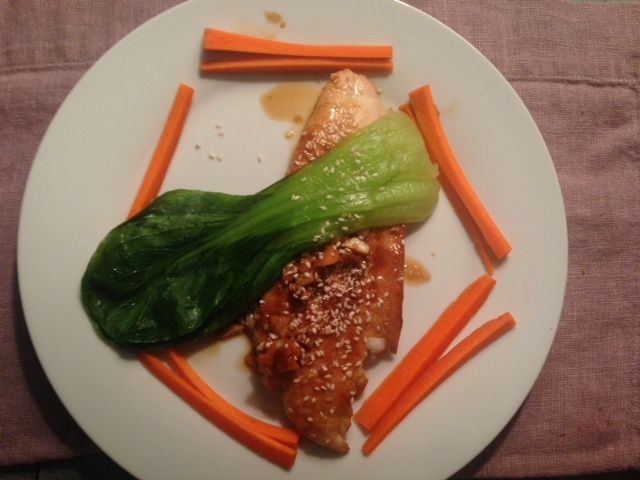 Finish: Add your fish to a plate, garnish with sprinkles of sesame seeds. Pair with some steamed bok choy, and raw carrot sticks like above, or get creative with the veggies you have on hand. Enjoy your delicious fish creation!